This morning I decided that it was time for a little shameless self promotion on the company blog, and apparently we are also overdue for an update of our “PRESS PAGE,” which I swear I plan to get to sometime in the not-too-distant future. So what all did we miss announcing you ask? Well, for starters this past summer we had Mindy and Tyler’s Club at Crested Butte Wedding featured on the exclusive Landlocked Bride – a blog dedicated to sharing details and wedding inspiration for Midwest and Mountain West brides (and grooms)! The post went live on August 9, 2012 and you can see it HERE! 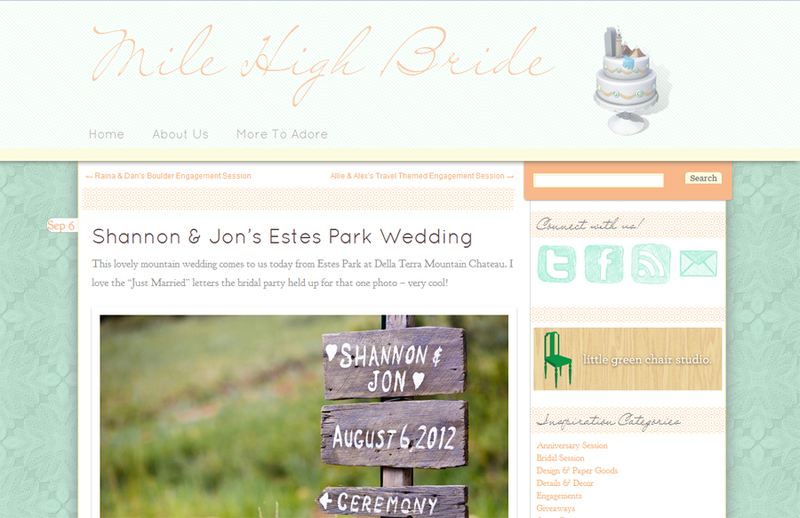 Just one short month later Shannon and Jon’s Della Terra Mountain Chateau wedding in Estes Park was featured on Mile High Bride – a blog intended to help Colorado brides-to-be find inspiration for their special day and connect them with the best local talent to make their dreams become reality! That post went live on September 6, 2012 and you can see it HERE! 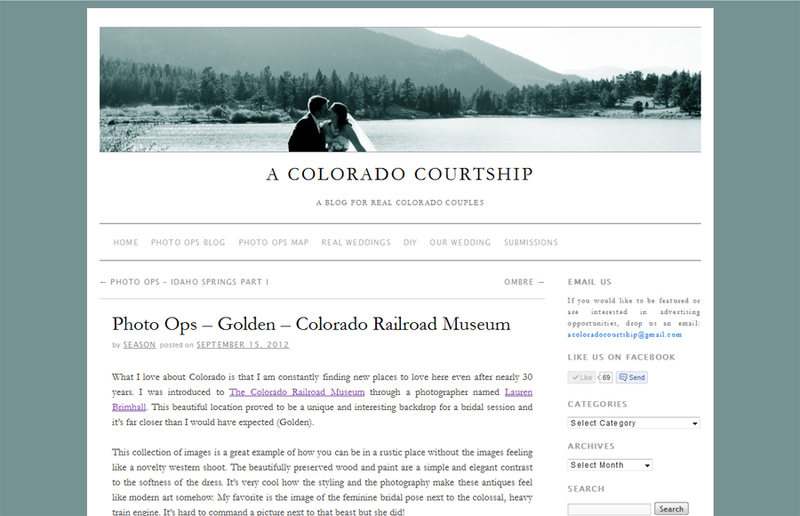 Then we REALLY got excited when just nine short days later Mindy got a second taste of the limelight when her Railroad Museum bridal portrait session was featured on A Colorado Courtship – a blog focused on featuring content from real Colorado weddings, styled shoots, DIY projects, and great places for engagement/wedding photos! The post went live on September 15, 2012 and you can see it HERE! 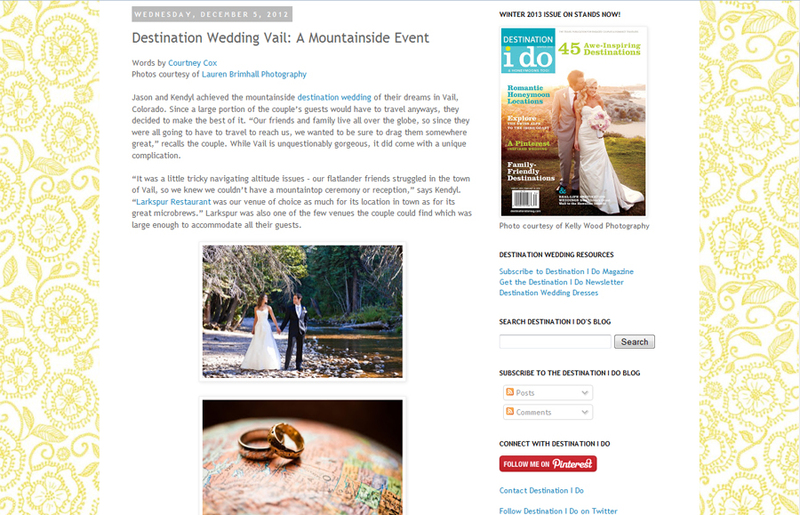 And just when you thought we were all finished tooting our own horns, just today Kendyl and Jason’s Vail Valley wedding at the Larkspur Restaurant is featured on Destination I Do – Brought to you by the editors of Destination I Do Magazine! You can see that post by clicking HERE! 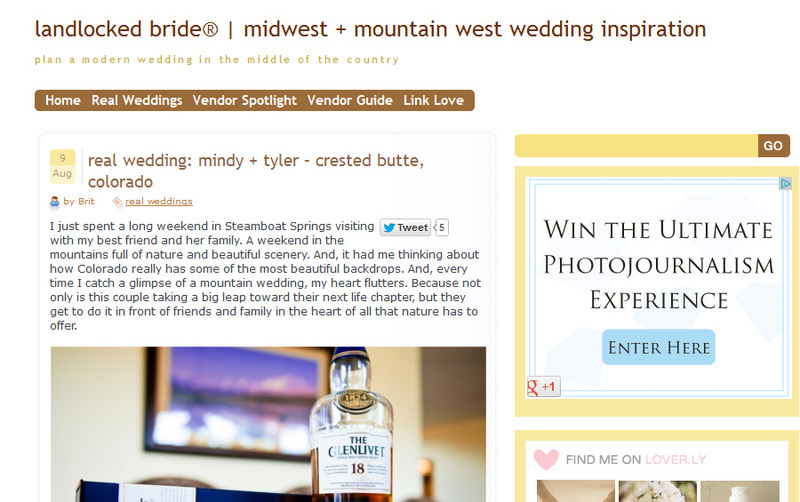 All in all we’re super excited about all of the great exposure we’ve had in the world of wedding blogs lately! A HUGE thank you goes out to all of the brides who chose us to photograph their one-of-a-kind special days, and to all of the editors at the aforementioned blogs who flattered us immensely by featuring our work. Okay, time to pop my hugely inflated head and float back down to reality and my adorable but badly teething five-month-old. Stay tuned for a couple more awesome engagements we have coming up in the coming weeks!